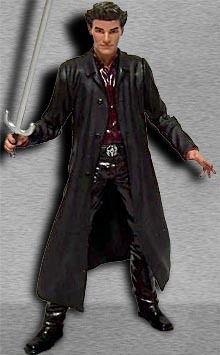 The first series of Buffy toys comprised four figures and based on Season 1 of the show. Therefore, Willow's hair (among other things) was still straight, Buffy's face was a bit rounder, and Angel wore nothing but black. Okay, so some things haven't changed. Dark, brooding, mysterious Angel. He was doomed to be a vampire of eternity until a gypsy curse changed his destiny and returned his soul to his soulless body. Now, not only does he regret his past heinous actions, but he relives them every day. So he lives alone, guilt ridden into never killing again. Experiencing one moment of true happiness will turn him back into Angelus, the evil, centuries-old vampire that he really is. Long before he had his own show, Angel was just another lumpy-headed stranger skulking around the sidewalks and alleyways of Sunnydale. Being a major player in Season 1, plus a burgeoning heartthrob for unaware highschoolers everywhere (OMG, "Bangel" 4-EVAH! Their lurve is meant 2 B! 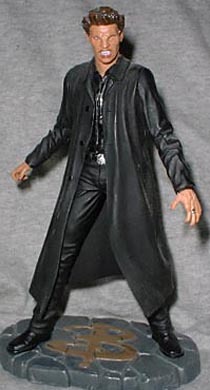 ), Angel was a shoo-in for an action figure. But you have to admit, sculpting a hot guy is a real change for MAC. Well, actually, perhaps "action" figure is a bit of a misnomer; by our definition, an action figure's got to have the Big Five in articulation - neck, shoulders, and hips. Angel, due to his long coat, moves only at the shoulders, elbows, and neck; not much action in this figure. While the coat restricts movement, it is well-sculpted. Coupled with the figure's stance, it looks as if Angel has just defeated some unfortunate foe and has spun around to face the next. A red shirt gives the figure a surprising bit of color, keeping it from becoming just a mass of darkness. Definitely not a bright red, though; that'd come later. There was a variant "vamped out" version of Angel available - it had the same body as the standard version, but new face and hands. The shirt was even painted black. Symbolic of Angel's decent into evil, y'think? Symbolism! Both versions of the figure come with the same accessories - a detailed stone base (all the figures in this line have one), a sword, and a human-sized (plastic) Claddagh ring. Not terribly impressive, but nice enough. Hope you've got some tiny, tiny fingers, because this definitely isn't one-size-fits-all. Given the choice, I'd say get the variant Angel - he's a bit more unique than the "human" version, and he can be either a good guy or a bad guy at your whim. What would be really cool is if they'd given him interchangeable heads.